Sandals Resorts has earned a worldwide reputation for providing two people in love with the most romantic vacation experience in the Caribbean. Currently, there are 14 Sandals Resorts on four idyllic tropical isles of Barbados, Jamaica, Antigua, Grenada, St. Lucia, and the Bahamas. Each resort offers stunning beachfront locations; a choice of à la carte restaurants, from white-glove dining to barefoot elegance; all premium brand wine and spirits, including an exclusive partnership with California’s legendary Beringer® Vineyards; luxurious accommodations in a range of categories; unrivaled watersports including the Caribbean’s largest PADI certification program; beautiful pre-designed and customizable wedding packages; and signature Red Lane® Spas, with services and treatments inspired by the region. 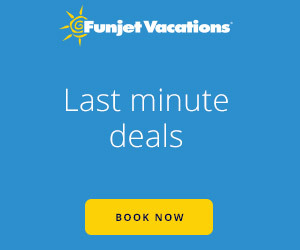 Book Sandals Resorts – The best Caribbean Vacation and All Inclusive Vacation for couples only in Barbados, Bahamas, Jamaica, Grenada, Antigua and St. Lucia. Call us today at 1-888-963-8986 or 1-559-207-0545 for your free consultation. Set on breathtaking Dickenson Bay, this romantic getaway offers the charm of a quaint Caribbean village accompanied by the refined luxuries of a world–class all–inclusive. Here you can engage in every land and water sport such as scuba diving as well as exercise at an impressive fitness center or relax at our full–service spa. When it comes to dining, there are five extraordinary restaurants to choose from. Discover Sandals Antigua Caribbean Village and Spa and rediscover each other. The exotic private escape – Unfolding like a grand estate, Sandals Emerald Bay is a 500–acre resort set along a one–mile stretch of white sand beach on Emerald Bay, Great Exuma, Bahamas. This all butler–service resort will offer a selection of 183 “magnificently–appointed,” luxury accommodations with styles that range from beachfront villas to charming bay house settings. Unique to the Great Exuma property is a stunning 18–hole professionally-designed championship golf course, reputed to be among the best in the Caribbean. Quietly nestled on Nassau’s famed Cable Beach, every facet of the celebrated Sandals experience reaches new levels of luxury at Sandals Royal Bahamian. This monument to regal elegance combines the grandest of European sophistication with the seductive passion of the Caribbean. You’ll revel in the grandeur of our colonnaded pool. As our pampered guest, you’ll dine on dazzling delicacies at your choice of eight gourmet restaurants. 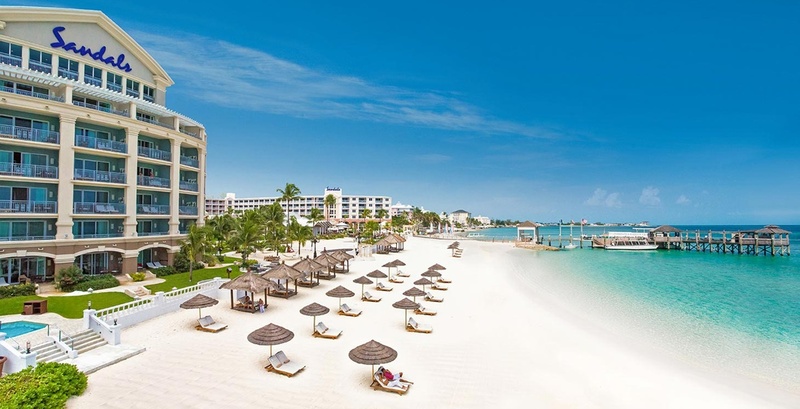 Sandals Royal Bahamian Spa Resort and Offshore Island, a rhapsody of elegance and romance. Introducing Sandals Barbados – one of the only all inclusive resorts on the seductive island designed exclusively for two people in love. Here, romance thrives amidst lush tropical gardens, endless turquoise ocean views and Sandals’ unparalleled personalized hospitality. Admired by lovers of extraordinary beauty, Sandals Barbados offers an alluring Luxury Included getaway featuring the best of Barbados with many quality inclusions including luxurious beachside accommodations, world-class dining, and exhilarating land and water sports. Everything is more beautiful in Barbados and now it’s also included and unlimited. What was already picture perfect is being transformed into “The Most Alluring Destination in the Caribbean.” An exotic, unspoiled hideaway, Sandals LaSource Grenada will offer guests a romantic, authentic Caribbean vacation while providing the Luxury Included® amenities and exceptional service that have come to be associated with the Sandals Resorts experience. The Sandals Royal Caribbean Resort & Private Island is truly in a class by itself, renowned throughout the Caribbean for its refinements and British traditions of a bygone era such as high tea and Continental breakfast in bed. And just offshore, Sandals’ exotic private island features a pool with a swim–up bar, a secluded private beach and an authentic Thai restaurant where some of the dishes are rumored to be aphrodisiacs. You’ll be treated to legendary “Royal Touch Service” at 4 gourmet restaurants and 5 bars while enjoying full exchange privileges at the neighboring Sandals Resorts, thus giving you a choice of 11 world–class dining experiences. Nestled in Romantic Ocho Rios, this lush resort is considered the Caribbean Riviera where fragrant gardens are tucked between the mountains and the sea. Sandals Ochi Beach Resort guests are only minutes away from championship golf at Sandals Golf and Country Club. Savor 9 gourmet restaurants on property plus 11 more at nearby Sandals and Beaches properties where full exchange privileges include the option of a full-service European Spa. Sandals Royal Plantation, Sandals’ first boutique resort, is an all-butler, all-oceanview suite resort located on dual cove beaches in Ocho Rios, Jamaica. Guests at Sandals Royal Plantation will receive all meals and snacks at 3 la carte restaurants, unlimited premium beverages including excellent house wines, fully-stocked in-room bars, 24-hour room service, use of the fitness center, tennis courts, steam room and sauna, unlimited use of the resort’s water sports facility including sailing, snorkeling, and kayaking, live nightly entertainment, shuttle to/from golf course and unlimited greens fees at Upton Golf Course. The All–Inclusive Sandals South Coast is located on the virtually untouched South Coast, 90 minutes from Montego Bay, on a large, private white–sand beach. All 360 spacious rooms and suites offer oceanfront views and are equipped with king–size, four–poster mahogany beds and Jamaican artisan–crafted furnishings. Guests booked in any of the Suite Categories will be able to enjoy Sandals exclusive Suite Concierge Service including fully stocked in–room bars and 24–hour room service. It is truly a “jewel in the south” and an wonderful location for adventure travelers or those who want to just relax. Clear turquoise seas kiss St. Lucia’s silver white shores with a gentle grace that makes this resort one of the most perfect places for soul mates to escape the world. This is a sensuously secluded enclave where lush green gardens frame classic island architecture, and time moves at a more languid pace to create halcyon days and passionate nights. On an island so “simply beautiful” the French and British fought over it for over 150 years, lies a resort considered the Caribbean’s grandest new addition. Set on its own spectacular peninsula surrounded by the sea on both sides, the resort offers breathtaking vistas of the bay and the mountains on one side and the island of Martinique’s distant shores on the other. Sandals Grande St. Lucian Spa and Beach Resort, where the views will steal your soul and the staff will steal your heart. Set along a half–mile crescent–shaped beach, this 210–acre enclave takes you to the height of glamour, where the service is rendered by staff genuinely pleased to have you as their guest. No detail has been spared to bring you an infinitely romantic gateway. Amenities such as the largest freshwater pool in the Eastern Caribbean, our own rolling fairways and the magnificent new Villa Suites on Sunset Bluff bring Sandals La Toc Golf Resort & Spa In St. Lucia to the pinnacle of perfection. Revel in some of the world’s most breathtakingly romantic beachfront settings. Choose from an unparalleled array of gourmet á la carte restaurants. Embrace unimaginable luxury in one of our incredibly lavish, innovative and exquisitely stylish suites. Restore body and soul in our sublime Red Lane® Spas†. Enjoy the very height of award–winning service, highlighted by the ultra–discreet pampering of our exclusive British–Guild–trained butlers. Experience for yourselves why, quite simply, the Sandals® Luxury Included® Vacation represents an unprecedented new level of supreme perfection. Dine royally at over 50 specialty restaurants from around the world! Sandals alone, among all-inclusive, includes gourmet dining. Choose from up to 15 amazing dining experiences at each resort and indulge in delectable cuisine at candlelit tables for two. Scuba diving, to windsurfing, sailing and much more – Sandals offers the best array of watersports in the Caribbean. With our top-of-the-line equipment and professional staff, you can glide atop the turquoise water or explore the world beneath. From world-class golf on emerald courses, with no greens fees, to state-of-the-art fitness centers with cutting edge equipment and classes; from tennis to beach volleyball; from basketball to table tennis – whatever sport you’re into – Sandals has you covered! At day’s end, or whenever the mood strikes you, you can relax in the finest rooms and suites in the Caribbean. Whether your suite is perched atop a coral bluff, or nestled in a lush tropical garden, Sandals exclusive Suite Concierge Service will fulfill your every wish. Each evening the spotlight shines on talented stars who rival those in the sky. From acrobatic dancers and live bands to fearless fire-eaters and beach parties, Sandals turns every evening into a time for celebration. Sandals Resorts provide the ultimate setting to celebrate each other – an idyllic paradise where all your wedding and honeymoon dreams can come true. Best of all, the basic wedding package is included! Unprecedented Butler Service, only available in the very highest level of suites, provides the most discerning guests with an unimaginably supreme standard of service and luxury by graduates of the Guild of Professional English Butlers. You will be amazed at how much choice a Sandals vacation includes! Dine around at all nearby Sandals. Take advantage of numerous impressive pools, whirlpools, saunas and even the occasional misting pool. Sandals Resorts Helicopter, Airport Transfers, Hotel Taxes & Tips. At Sandals we include everything you need for a perfect, worry-free vacation – from airport transfers, in air-conditioned buses, to all tips, gratuities and hotel taxes. That way the only thing you have to think about is having fun.††† Private transfers in catered vans, luxury cars, and helicopter (additional fee) are available at select resorts. Experience the Sandals Difference – Stay at one Sandals Resort and enjoy full exchange privileges at all Sandals! Courtesy shuttles are provided within each of the local towns. ††For non-certified divers, resort dive course available at an additional cost. Night dives additional. †††Free wedding offer is valid for 6-night minimum bookings and is applicable in any room category. All weddings are subject to mandatory government and documentation fees, which vary by island. All weddings that do not meet the minimum night stay requirement will be subject to a $750 processing and administrative fee, which is inclusive of government and documentation fees. All fees are subject to change at any time. To book a wedding with Sandals the agent/passenger must contact Sandals wedding department directly. All promotions are applicable to change and subject to availability. Offers may be changed or withdrawn at any time without notice. †††Private transfers & helicopter transfers at select resorts may require an additional charge.